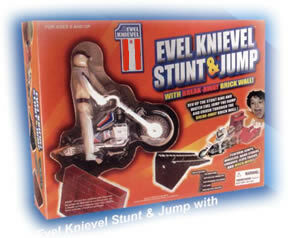 Evel Knievel was the most notorious American motorcycle daredevil and entertainer. He was famous in the United States and throughout the world between 1960s and early 1980s. 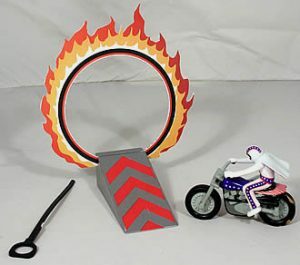 Knievel’s nationally-televised motorcycle jumps, including his 1974 attempt to jump Snake River Canyon, represent four of the most watched events on ABC Wide World of Sports. 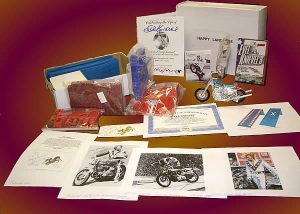 Evel’s achievements, including his record 37 broken bones, earned him several entries in the Guinness Book of World Records. 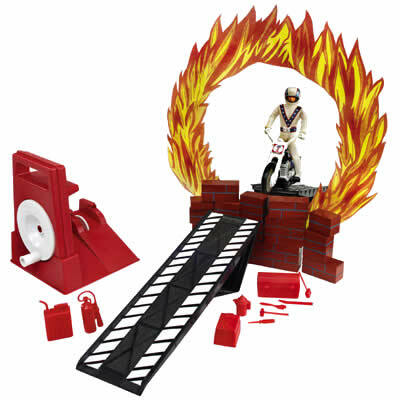 Now you can relive the legend and attempt some of his stunts with one or more of the Evel Knievel sets available through American Classic Toy, Inc.
Set up some of Evel Knievel’s most famous stunt scenes with this 40 piece stunt set.